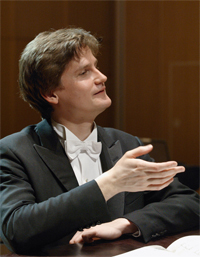 Olli Mustonen has a unique place on today's music scene both as a pianist, conductor and composer. As a pianist, he has challenged and fascinated audiences throughout Europe and America with his brilliant technique and startling originality. At the heart of his piano playing Mustonen has a deeply held conviction that each performance must have the freshness of a first performance and this tenacious spirit of discovery leads him to explore many areas of repertoire beyond the established canon. As a soloist, Mustonen has worked with most of the world's leading orchestras, partnering conductors such as Ashkenazy, Barenboim, Blomstedt, Boulez, Chung, Dutoit, Eschenbach, Gergiev, Harnoncourt, Masur, Nagano, Salonen and Saraste. Mustonen is also increasingly making his mark as a conductor with recent highlights including leading the Staatskapelle Weimar, West Australian Symphony Orchestra and the Melbourne Symphony Orchestra. Recent conducting engagements include a return to the Netherlands Radio Chamber Philharmonic, Northern Sinfonia and Tchaikovsky Symphony Orchestra and soloist appearances with the Leipzig Gewandhaus Orchestra under Herbert Blomstedt and the Mariinsky Theatre Orchestra under Valery Gergiev. Olli Mustonen's recording catalogue is typically broad ranging and distinctive. His recording for Decca of Preludes by Shostakovich and Alkan received the Edison Award and Gramophone Award for the Best Instrumental Recording. In 2002 Mustonen signed a recording contract with Ondine, with whom he has released several albums, including the Complete Beethoven Piano Concertos with Tapiola Sinfonietta.